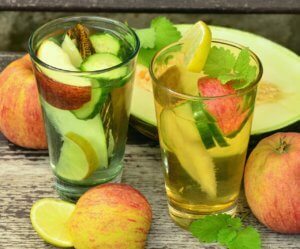 In simple terms, cucumber water is water that’s mixed with slices of cucumber, made by immersing and soaking cucumber slices in a pitcher of water. It may sound too simple, but many of the nutrients found in cucumber will be infused with the water, boosting overall nutrient intake. Cucumbers are made of about 95% water, too, making them a popular choice in detox cleanses. One of the easier natural therapies to make, a glass of refreshing cucumber water helps increase your levels of vitamins B and C. It’s also rich in beta-carotene, manganese, and molybdenum. Furthermore, cucumbers contain anti-inflammatory flavonols and other different antioxidants, including cucurbitacin. Water intake can be done through a couple of different ways of beverages and foods. Hydration is very important and drinking cucumber water not only hydrates your body, it also helps prevent constipation and kidney stones. Thus, if you find it a challenge to keep drinking water, fusing it with nutritious cucumbers can help you increase your nutrient intake while keeping you well hydrated. Cucumber is low in calories and is quite good when it comes to filling you up. Not only does it prevent overeating, it also aids in fast weight loss. Water is naturally good at this due to thirst being often mistaken for hunger. Therefore, when you fuse cucumber and water and include the resulting mixture in your diet, it can help prevent overeating and unnecessary snacking in between meals that can lead anyone on any diet astray. Cucumbers are known to contain a unique compound known as cucurbitacin, which acts as a potent antioxidant in the body. Another study done by the American Association for Cancer Research showed that fisetin, an anti-inflammatory compound found in all cucumbers as well as in strawberries can help slow down the progression of prostate cancer. Although there aren’t that many minerals found in cucumber water, it does contain trace elements of silica and manganese among others. According to a research done at the University of Cambridge, food products like cucumber that are rich in silicon can help to strengthen the bones. Furthermore, cucumbers also help lower the risk of osteoporosis as you age. Drinking a glass of cucumber water is a great way to help increase your levels of potassium, a vital electrolyte that the body needs for overall health. Potassium acts as a vasodilator, which helps lower blood pressure and therefore the strain on the cardiovascular system. So, there you have it. These are just some of the most notable health benefits of cucumber water. This is one of the easiest natural homeopathy treatments you can make on your own, right in the comfort of your own home. Just remember to still see a doctor if you have any health problems that needs to be addressed by one.